where M is an earthquake magnitude, is the maximum displacement during high-frequency energy radiation from the arrival time of a P-wave, is the epicentral distance, is duration of high-frequency energy radiation. The duration of high-frequency energy radiation can be estimated by band-pass filtering of first arriving P-waves (e.g., Hara, 2007a). are 0.79, 0.83, 0.69, and 6.47, respectively (the units of were m, km, and s, respectively). We applied this method to the October 25, 2010 Southern Sumatra earthquake (the origin time: 14:42:22 UTC; the location 3.484°S, 100.114°E after USGS). Figure 1 shows an example of measurements of high-frequency energy radiation. The estimated duration is 109.7 sec. The estimated magnitude using the above formula is 7.61, which agrees with Mw 7.8 from the Global CMT and 7.7 from USGS WPhase MT. The contribution to the magnitude from the maximum displacement amplitude and epicentral distance (the first and second terms of the above formula) and that from the duration of high frequency energy radiation (the third term of the above formula) are shown in Fig. 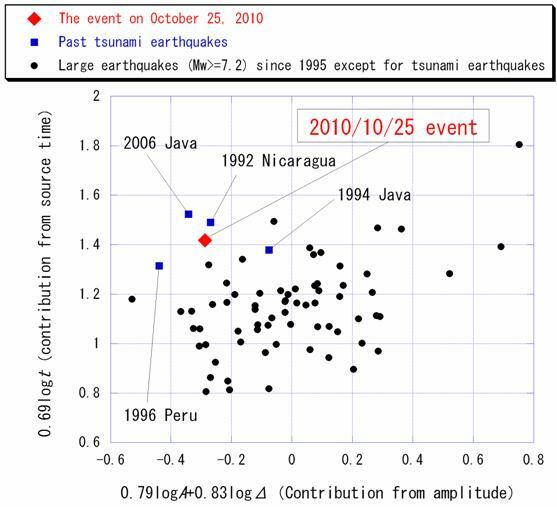 2 with those obtained for the large (Mw>=7.2) earthquakes that occurred since 1995 including the past tsunami earthquakes. Considering the low amplitude and long duration, which are the characteristics of tsunami earthquakes, the event that occurred this time is likely to be a tsunami earthquake. Fig. 1. An example of measurements of high frequency energy radiation. 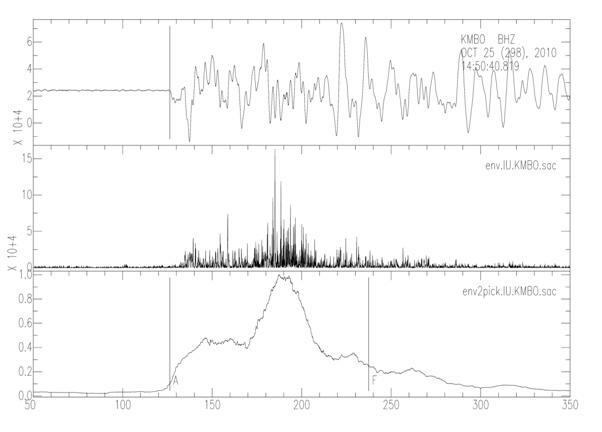 The upper, middle and lower traces are an observed seismogram, the squares of the band-pass (2-4 Hz) filtered seismogram, and its smoothed time series (normalized by the maximum value), respectively. “A” and “F” in the lower trace denote the arrival of P-wave and estimated end of high frequency energy radiation, respectively. Fig. 2. Contributions to magnitudes from maximum displacement amplitudes and epicentral distances (the horizontal axis) and those from durations of high frequency energy radiation (the vertical axis) are plotted for the October 25, 2010 Southern Sumatra earthquake (denoted by the red diamond) and the large (Mw>=7.2) earthquakes that occurred since 1995 (the blue squares: past tsunami earthquakes; the dots: others). The results for the latter are from Hara (2007b). Hara, T., Measurement of duration of high-frequency energy radiation and its application to determination of magnitudes of large shallow earthquakes, Earth Planets Space, 59, 227–231, 2007a. Hara, T., Magnitude determination using duration of high frequency energy radiation and displacement amplitude: application to tsunami earthquakes, Earth Planets Space, 59, 561–565, 2007b.